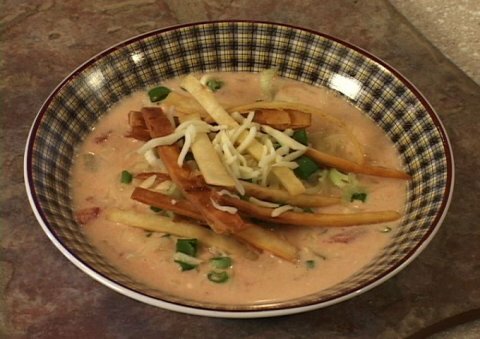 Click here to see how to prepare Tortilla Soup: 56k | 300k. Although Dan and Colleen look pretty smooth, they had a cheese problem that we turned into a blooper. Click here to see the blooper video. Click here to find out more about the cool Tortilla Maker that was mentioned in the video. Saut� onions in butter. Add chiles and tomatoes. Cook 8-10 minutes. Add cream cheese. Stir till melted. Add broth and remaining ingredients. Stir to incorporate but do not boil. Slice tortillas into 1/2-inch strips. Heat 2 tablespoons oil in frying pan. Add strips to oil and fry until brown on both sides. To serve, ladle soup into bowl. Top with fried tortilla strips, shredded Monterey Jack cheese, and diced onions.